It has been almost 2 years since I've been cancer-free! Woo Hoo! Back in 2011 when I was first diagnosed with breast cancer, that dreaded news devastated me. Today, almost 2 years later, I look back at all the struggles and feel so grateful and appreciative of all the love, kindness, and support that I was given. So many people reached out to me to get me through the fear and the hardships... Family, friends, my doctors and everyone in their offices, survivors, and folks from organizations such as the American Cancer Society, The Breast Cancer Research Foundation, and local breast cancer groups. Today I pledged once again to continue supporting The Breast Cancer Research Foundation through the Survivor's Circle. Ahh! Products will always support the awesome people that are working so hard and diligently towards a CURE, hopefully in my lifetime! So, to everyone out there affected by breast cancer, and to everyone out there trying to eliminate it once and for all, I say to you: Let's do it together NOW! On behalf of our entire team, thank you for your thoughtful contribution to The Breast Cancer Research Foundation. All of us at BCRF are truly grateful for your generous support and your efforts to advance breast cancer research and awareness. The Foundation’s commitment to preventing and curing breast cancer is neither a simple tagline nor an empty promise; it is our pledge to the individuals who receive this diagnosis each day. 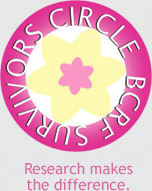 When the late Evelyn Lauder established BCRF nearly 20 years ago, she was determined to fund transformative scientific investigations that aim to improve cancer treatment and prevent breast cancer in future generations of women – research that saves lives. Your gift will advance our mission and will provide scientists with the crucial dollars needed to bring about lifesaving progress. Every BCRF-funded discovery offers hope for the resilient women, men and families facing breast cancer. With the freedom to explore creative and innovative science, the 197 researchers comprising BCRF’s 2012-2013 research brain trust are using our support to unravel the multifaceted defects at the core of breast cancer. Our global commitment to excellence ensures that the most forward-thinking scientists, regardless of location, receive necessary funding and have the opportunity to collaborate with likeminded visionaries. Your support fuels their achievements and will have a lasting impact on breast cancer research and the investigation of related diseases. We honor the contributions of our donors by remaining fiscally responsible. Currently, 91 cents of every dollar spent by the Foundation is directed towards research and awareness programs. BCRF is still the only breast cancer organization to receive an A+ from CharityWatch, in addition to a four-star rating from Charity Navigator for the tenth time since 2002. Thank you again for your dedication to our mission. Our progress would not be possible without your vital support. On behalf of The Breast Cancer Research Foundation, thank you again for your generous gift.